A loan of $8,000 helped to purchase raw materials, including fabrics, threads, and other embroidery supplies, to finish preparing for the Santa Fe Folk Art Market in July 2016. 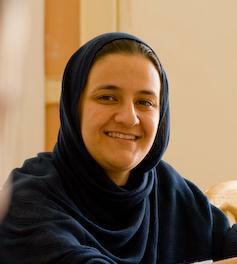 Rangina founded Kandahar Treasure in 2008 to help the women of Kandahar, Afghanistan sustain their lives through Khamak, the unique embroidery that the women of this region have been practicing for centuries. Khamak is an art form that has traditionally been used in cultural assets such as bridal trousseau, baby sets, and men's traditional attire. Kandahar Treasure has brought this art form to the world market not only to help revive the tradition of the artwork, but also to sustain and empower women in the process. Kandahar Treasure received a Kiva loan in 2015 to buy 9 sewing machines to increase productivity and provide safer transportation to the female workers. Additionally, two cars were rented to safely transport women workers, increasing productivity and pride in the embroidery work. After a successful visit to the Santa Fe Folk Art Market in July 2015, Rangina was able to pay back her first loan in full on time. Rangina plans to use a second Kiva loan to prepare for the market opportunity at the Santa Fe Folk Art Market in July 2016. Because the organization has lost its opportunity to sell products to the NATO troop members in Afghanistan in 2015, Kandahar Treasure has not been able to generate sufficient profits to maintain full operation. A loan is needed to work on preparing stock for the summer market in Santa Fe. Working with Kandahar Treasure is the only source of income for over 500 women artisans. The organization is currently preparing for its 11th visit to the Santa Fe Folk Art Market. The market has provided the organization with consistent sales every year. Rangina is committed to creating a sustainable, successful enterprise to provide long term employment for women in one of the world's most dangerous parts. Kandahar Treasure is committed to pushing its standards for excellence and hopes to revive the war-torn nation of Afghanistan one stitch at a time. It supports artisan organizations that have an impact beyond a single artisan. Working capital loans through the Alliance for Artisan Enterprise will be offered to members of the Alliance’s worldwide network or their suppliers. The borrowers are the owners of small, growing businesses in the developing world. This loan will be backed by purchase orders of the borrower’s handmade, artisan products. By supporting this loan you are supporting artisans around the globe. The Alliance for Artisan Enterprise was launched by Hillary Clinton in 2012 and is hosted by the Aspen Institute. It is a collaborative effort of 45 organizations, corporations, and individuals working together to promote the full potential of the artisan sector to spur economic development. The Alliance for Artisan Enterprise and Kiva are working together to help bridge the financing gap for artisans around the world. The borrowers are owners of small and growing businesses in their countries. Loans will support the purchase of supplies borrowers need to produce handmade, artisan products. Kiva funds will enable the Alliance for Artisan Enterprise to expand its network of artisans and facilitate economic growth. Through a partnership with the Alliance for Artisan Enterprise, Kiva is helping small scale artisan entrepreneurs around the world overcome financial obstacles. The artisan sector generates income, creates jobs, fosters community development, and safeguards culture and meaning that are essential components of healthy and sustainable development. Kiva funds will enable the Alliance for Artisan Enterprise to expand its network of artisans and facilitate economic growth.